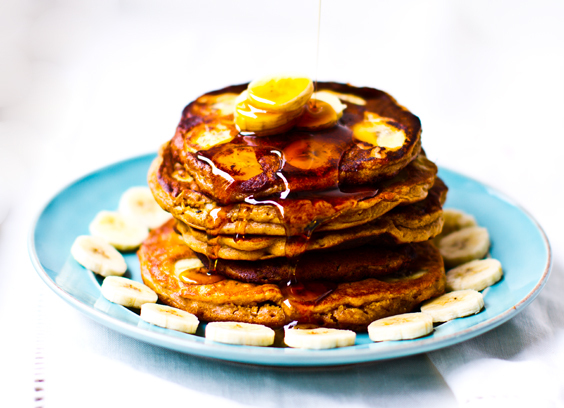 Peanut Butter Banana Oat Pancakes. Vegan. I have been experimenting with peanut butter pancakes lately and I've found that I sorta, kinda, love them. 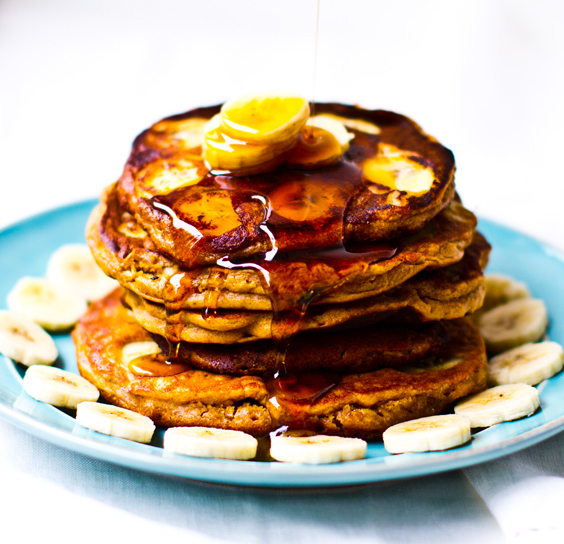 My go-to, crave-it recipe is for these vegan Peanut Butter Banana Oat Pancakes. Creamy peanut butter, sweet circles of banana, cozy rolled oats, a pinch of flax seeds, a hint of vanilla, plenty of cinnamon and a waterfall of dark amber maple or raw agave syrup over top. Scene -> Lazy-breakfast Sunday. You are feeling splurge-y. My splurge-worthy AM meal: pancakes. Childhood-memory thing, I think. Every Saturday morning when I was a kid the menu included three things: fresh squeezed OJ, freshly sliced cantaloupe and fluffy fresh apple pancakes - made using the apples from the tree in our backyard. 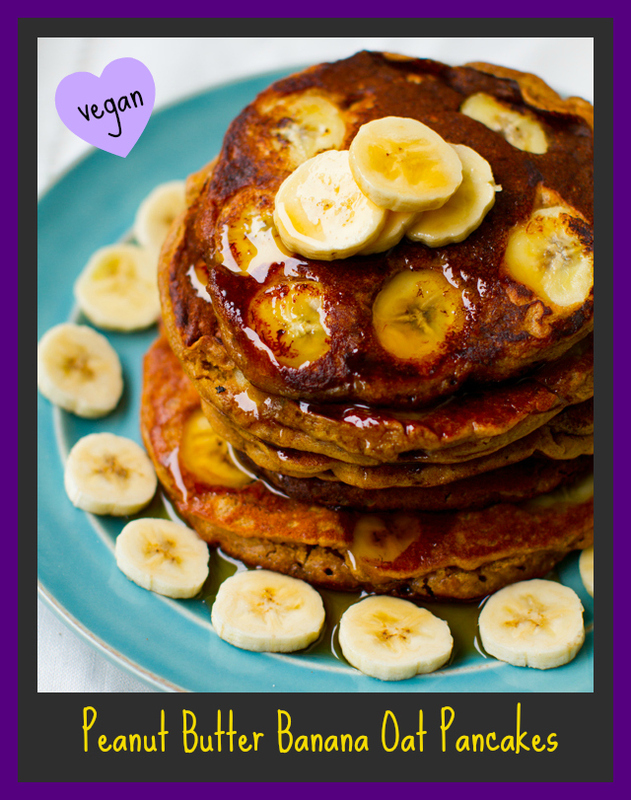 And just because pancakes are indeed a carb-fest, that doesn't mean they can't have a few redeeming qualities.. Pancakes can easily be infused with plenty of good-for-you ingredients like fruit, whole grains, nuts, seeds and more. Pancake morning. Go. Set this tall stack of pancakes on the table, fresh fruit salad and soy lattes too, and don't you dare change out of your pajamas. The dress code is very strict for this cozy morning spread: no slippers, no service. 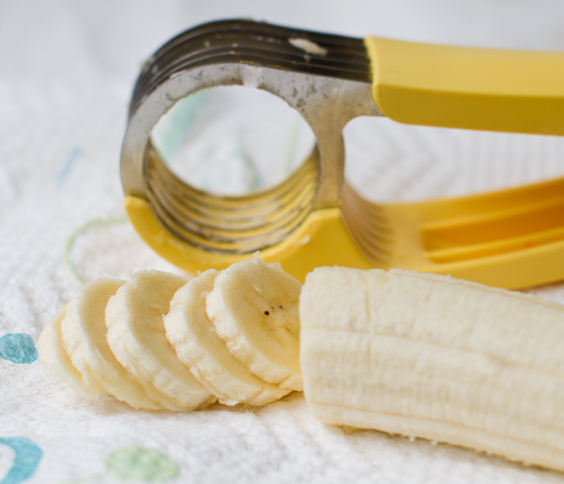 Easy Banana Slicing.. I have to admit, the one totally unnecessary kitchen gadget I love - this banana slicer I found at Williams and Sonoma. It is just a fun little gadget. Perfectly width-ed slices in a flash..
To be or not to be .. gluten-free?.. For this recipe, I used a mixture of buckwheat and whole wheat flours - although I'm pretty sure this recipe would be awesome if you subbed in a gluten free flour. Like many people, I have been experimenting with less gluten in my diet lately. I've found less gluten is a good thing, but I still eat plenty of it I assure you. I am always anxious to improve the way my body reacts and thrives from the foods I eat - so gluten is just another one of those interesting variables in my diet. My curiosity continues. Actually if you are looking for a truly wonderful read in regards to GF, check out Manifest Vegan's story about how and why she went gluten-free - her story is quite brave and inspiring. Love her. Anyways, back to my very not-gluten-free, but could-be-gluten-free stack of pancakes. 1. Combine flax seeds and soy milk. Let stand for at least 2-3 minutes to thicken. 3. Stir peanut butter and agave or maple syrup into the flax/soy then fold this wet mixture into the dry ingredients. Fold in the apple cider vinegar last. 3. Heat a small drizzle of safflower oil in a nonstick pan. 4. Pour batter onto hot pan. 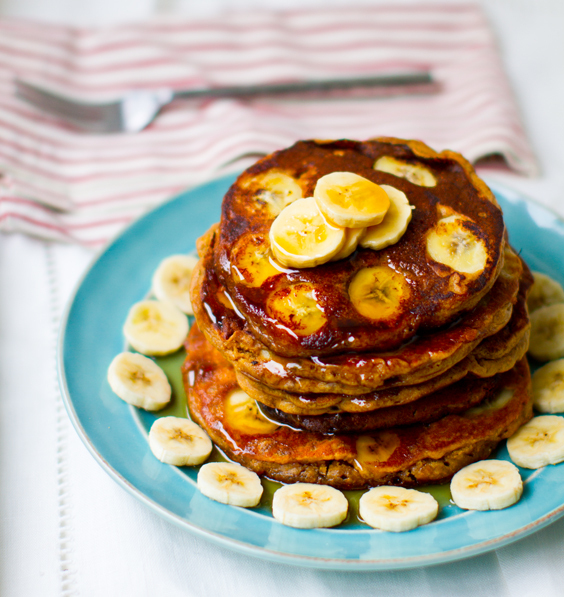 When pancakes start to bubble through - add banana slices to wet batter and flip. Cook for another few minutes and transfer to paper towel to cool. 5. 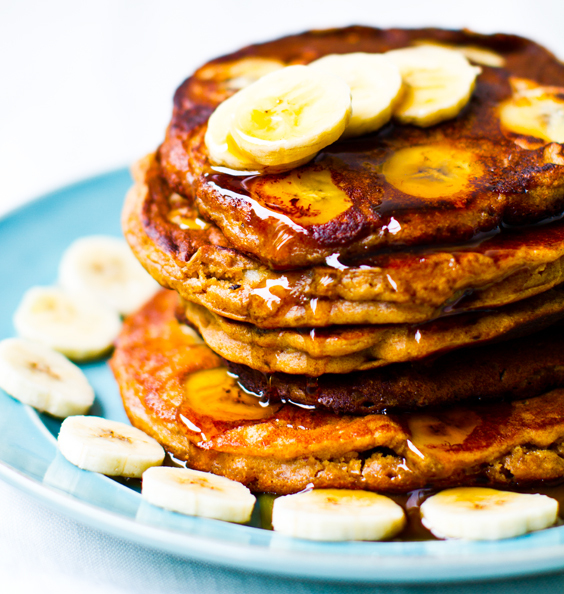 Serve with fresh bananas and a nice drizzle of agave or maple syrup.